An industry leader in satellite communications since 1976, Inmarsat has become a backbone for critical communications and offers satellite devices that have been engineered for field conditions and high-quality nearly-global coverage. For basic voice connectivity and low bandwidth (narrowband) data, the IsatPhone from Inmarsat provides global communications coverage, except in the polar regions. The Inmarsat network uses three (3) geostationary satellites to provide voice and data communications almost everywhere on earth. Each satellite is equipped with a single spot beam that covers up to one-third of Earth’s surface. Because Inmarsat coverage extends from latitudes of -82° to 82° regardless of longitude, higher latitudes will have lower performance. Registration to the network requires a clear line of sight to the equator and may not be suitable for use in canyons or mountains. Because the satellite orbit further from earth, network registration times may take a little longer than with competing networks. With an accessible price point and coverage that spans most of the globe, except the polar regions, the IsatPhone from Inmarsat is a great option for budget-conscious individuals. It’s important to remember that the antenna on Inmarsat devices must have an open view of the sky towards the equator, so they are best used in a stationary position and less suited to walking while talking. Also, the availability of service at the edge of the coverage areas fluctuates, depending on various conditions. 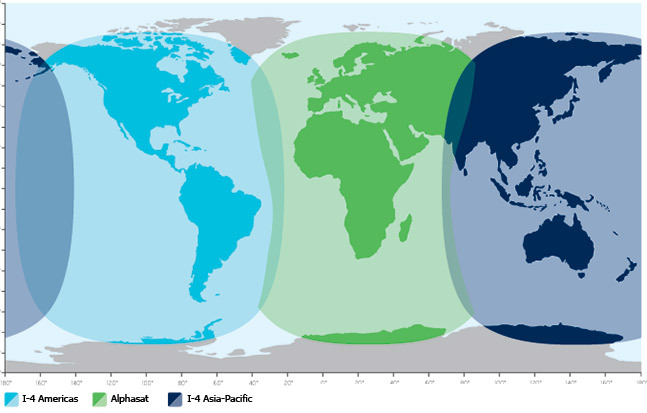 How Inmarsat Satellite Coverage Works? The Inmarsat satellite constellation consists of 13 satellites in a geosynchronous (GEO) orbit approximately 22,000 miles above the earth. The satellites are positioned to transmit radio beams in two global configurations covering the oceans and major land masses. It is important to note that Inmarsat coverage extends from latitudes of -82° to 82° regardless of longitude, so higher latitudes like the polar regions are not covered. International travelers: Please research local laws before you travel as some countries don’t permit the use of satellite phones. For travel to India, note that local laws require airtime service be acquired from the local provider BSNL. The downside? No coverage in the polar regions, longer network registration times and best used in a stationary position (with the antenna pointed toward the equator). How to Connect to the Inmarsat Network? Using an IsatPhone, ensure you are in a stationary position and orient the antenna so it has an unobstructed view of the sky toward the equator. 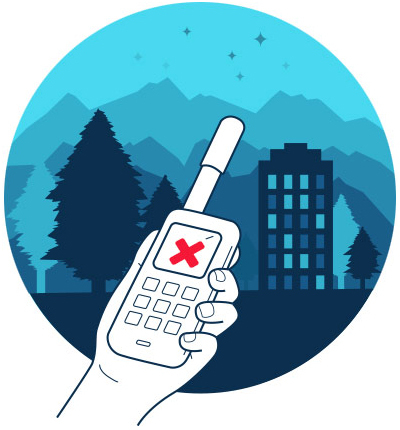 Use your satellite phone near to tall buildings, trees or mountains that can obstruct the line of sight with satellites in the sky. Note: The polar regions aren’t covered by the Inmarsat satellite network. How do I call a landline or cellular number using an IsatPhone? Press and hold the 0 key until the + appears or dial “00”. Dial the country code, area code and phone number. What is the dialing sequence to call an IsatPhone from a landline or cell phone? From your phone, dial “00” or press and hold the 0 key until the + appears, then dial the 870 IsatPhone number. How do you dial IsatPhone-to-IsatPhone calls? Press and hold the 0 key until the + appears followed by the 870 Inmarsat phone number. Does IsatPhone support text messaging? Yes, it is easy to send a text message from you satellite phone and incoming text messages are free to receive. Visit our Knowledge Base for step by step instructions. How do I receive calls on my IsatPhone? To receive a call on your Inmarsat phone number, the antenna of your device needs to be pointed toward the equator to register and connect with the Inmarsat network. To maintain your network connection with the Inmarsat satellites over the equator, the device should remain in a stationary position while you are expecting a call or on a call. TIP: Roadpost’s Isatphone monthly plans and prepaid cards include voicemail service, in case you miss a call. How do contacts call my IsatPhone? There are two ways that someone can call you on your Isatphone phone. Note that the first three digits (870) is the international country code for an Isatphone. Dial your IsatPhone phone number directly, which can be expensive depending on the network they are calling from. From North America, they would dial: 011-870x-xxxx-xxxx (your Inmarsat phone number). Add an optional Dedicated US Phone Number to your monthly service plan. With this option, you will be assigned your own US-based phone number, in addition to your Iridium phone number. Callers can reach you directly using either phone number. You pay a low monthly fee for this dedicated US number, and a low per-minute rate to receive calls made to your US phone number. What does it cost to call an Inmarsat phone number? Cellular and landline network operators can charge quite a lot for calls to a satellite phone number. To reduce the expense for your contacts, adding an optional Dedicated US Phone Number. This is less costly than calling your IsatPhone number directly, and enables the calling party to dial a US based phone number which is automatically routed to your IsatPhone.